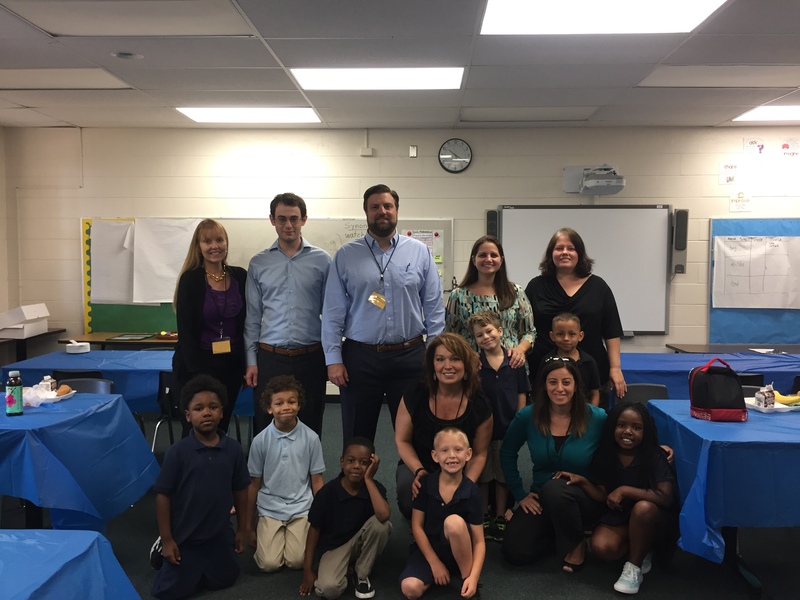 The Sembler Company, a shopping center developer based in St. Petersburg, Florida for over fifty years, begins its second school year, matching employees as mentors with students at Bear Creek Elementary School in St. Petersburg, Florida, for the Lunch Pals program. Lunch Pals is a lunchtime mentoring program where businesses, community organizations and individuals are paired with a school to provide students with the additional presence of caring adults. Each student is identified by school personnel as a child who could especially benefit from a mentoring relationship. Sometimes they are facing social, family and/or academic challenges, or are just at a point in their lives where they will especially benefit from an additional positive and encouraging adult who spends time with them. The Sembler mentors meet one-to-one with their assigned student for 30 minutes during the student’s lunch time on a designated day each week. Sembler currently has seven employees matched with students who they’ve been with since the last school; and three more employees are awaiting a match. About Sembler’s enduring philanthropic spirit, CEO Ron Wheeler said, “No other single accomplishment makes me prouder than our community participation and the fact that our people are so generous to others.” Wheeler is awaiting his own match at Bear Creek Elementary School. Additionally, Sembler employees are working with the Pinellas Education Foundation to raise funds specifically to benefit Bear Creek Elementary. The funds they raise go directly toward a Maker Space program – which will be a designated area in the school that facilitates a STEM (Science, Technology, Engineering and Mathematics) education elective program where children will work hands on through different activities to further their education in these fields. Past granted programs include Anti-Bullying Programs, Reading Programs, Music Programs, Aftercare and Tutoring Programs, etc. Next PostSembler In The News: What Are We Up To?